If you love design, you’ll go crazy for Claridge villa. The magazine-worthy living area is all-white with exposed beams and an open design. Dark, well-polished wood cabinetry and furniture stands in stark contrast to the warm white interior. The home strikes the perfect balance of warm, modern, and Zen. Relaxing in the bedrooms is a breeze, since each bed has a canopy overhead and Balinese furnishings all around. Large pool! Close to beach! Villa Claridge is located on the hillside in Anse des Cayes with ocean views from every room. This villa is warm and modern, with top-of-the-line amenities and an attention to detail that few villas achieve. The oversized terrace has panoramic views of the ocean and island. Take a dip in the pool or sunbathe in a lounger in the afternoon. The al fresco dining area is tucked on the side of the house, with a gazebo to shade the table and a BBQ grill under the palm trees. There’s another dining nook on the observation deck that’s the perfect size for cocktails, with a stunning vista of the sea. Guests can cool down in the outdoor shower before curling up in a couch to read, relax, and catch up with family. The lower level terrace opens to the Great Room, which has high ceilings with exposed beams, and an airy, all-white interior. There’s tons of space in the living room for guests to spread out, and it blends with the gourmet kitchen. The kitchen has sleek, polished cabinetry and top-of-the-line appliances, with a vent hood over the stove, a deep double sink, and a large fridge. On the other side of the living area, a cozy sitting area leads into the master bedroom. This suite offers a queen-sized bed, an ensuite bathroom, a TV, and a furnished balcony. Each of the other three bedrooms also have queen-sized beds, ensuite bathrooms, TVs, and balconies. The bunk room has six twin beds, perfect for a large family gathering. The ensuite bathrooms are all well-sized, with luxurious showers and large vanities. Claridge Villa is within a 5 minute drive of Anse des Cayes and St. Jean Beach. Anse des Cayes is great for surfing, with changing winds and a mostly residential coastline. It’s tucked away from the rest of the island and usually pretty quiet. St. Jean Beach is more picturesque and popular, with lots of restaurants and great snorkeling. It’s also a short drive to Gustavia, where red roofs peek through a tropical landscape amongst historical sites and hot spots. Continental breakfast included in the rental rates during High Season, Christmas and New Year's Eve. 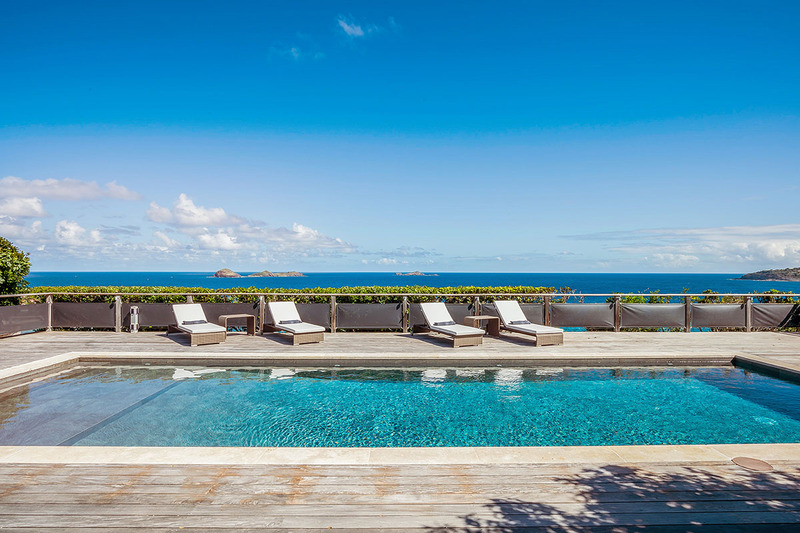 Villa Claridge on St. Barths: Perfect villa, perfect service! Villa Claridge is a spectacular 4 bedroom villa overlooking the Bay of St. Jean and Eden Rock hotel on one side, and the entire Anse des Cayes on all the other sides of the property - it is the PERFECT St. Barth’s location. The villa has beautiful architecture and design, and is in impeccable condition. Each bedroom has it’s own separate and private space on the property, and the gathering places provide a wonderful venue for a large family or friend’s holiday. Every single detail has been thought of for you. We cannot wait to return to Villa Claridge, and will recommend this home to all of our friends. Thank you! WhereToStay.com and Shawna provide spectacular service. Every single step - from finding the perfect villa, to what to expect when you get there, to what to do each moment of the day - is meticulously planned to perfection and communicated on a timely basis.